“We’ll definitely come back again next year.” – that was what I wrote at the end of Cheng Beng at Sam Poh Tong last year. Over the years, I’ve been following my parents to offer prayers to my grandparents. Traditionally, families burn spirit money and paper replicas of material goods. 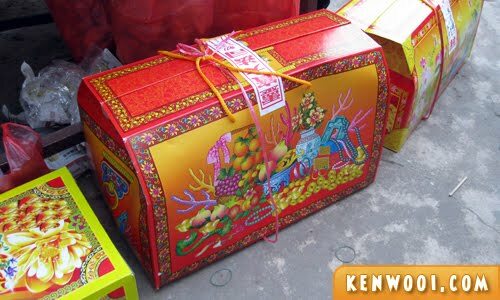 In Chinese culture, it’s believed that people still need all of those things in the afterlife. When I was there this year, I can’t help it but to notice what the other families are burning for their ancestors. A bundle of colorful papers. Not sure what it is though, perhaps their ancestors like colorful stuff? A huge treasure chest. I believe it contains essential needs such as clothing, food and I don’t know what else. Then, more of the bigger stuffs. A red van – with a driver included. For the ladies, a pink handbag. It should have girly stuffs such as packs of tissues, 10 different lip glosses and other cosmetics, snacks and lots of other junk. 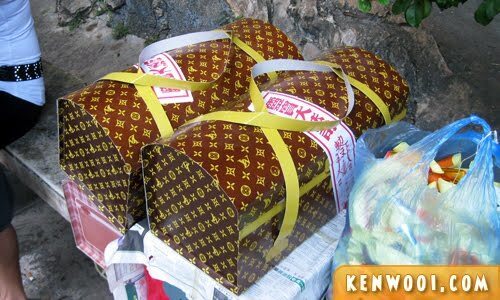 Then, the most coveted one – the LV (in this case, LW) handbags! But it makes me wonder – were our ancestors so materialistic that they want LV (paper) bags sent to them? 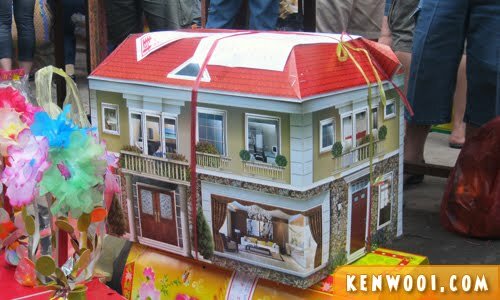 Next up, a huge house or bungalow – with furnishings all illustrated over it. So luxurious. 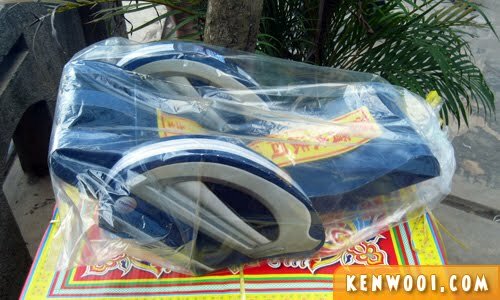 A massage chair, probably an OSIM one. Life’s definitely good for the ancestors. 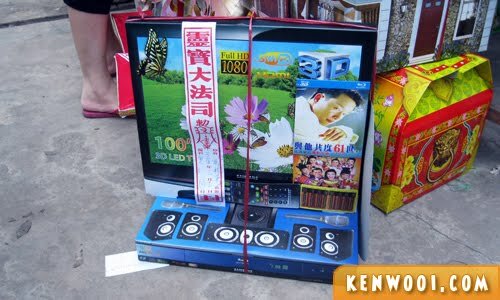 Then, a Full HD television with a complete set of home theater. I’m sure it’s pretty happening on the other side of the world eh? 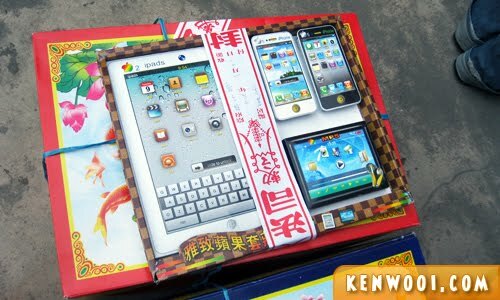 The iPad and iPhones for the ancestors as well? Wait… do they even know how to use them? Coz it used to be phones with big buttons, paper pads and medication tables back then. But you know what, even before the announcement of the new iPhone 5 – Apple apparently has already released the iPhonie 5 for the deceased. 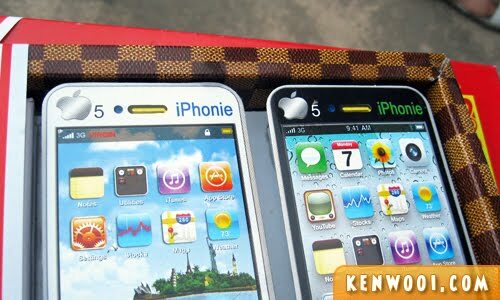 Presenting… the iPhonie 5! This changes everything up there. Again. hahahahaa!!!! I know the burning of offerings is getting much more interesting each year. When I was young, I used to throw the colourful paper over the grave. LOL! bro did u fold that urself??? DAM COOL WEH!! 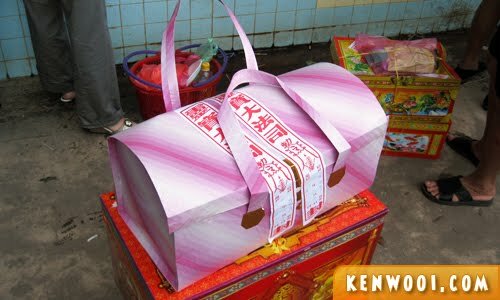 to me, qing ming is the time when the elders spend more money on paper items that are to be burn, and cause more air pollution. 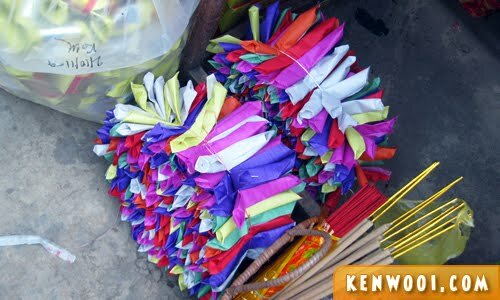 not only that, they burn firecrackers “pao jeong” as long as they can find. what for? to wake the ancestors? Burning all these are like burning money! LOL! I doubt the dead will get them, and even if they do how do we know they have not already reborn into the world? So we are burning for who now? Interesting. 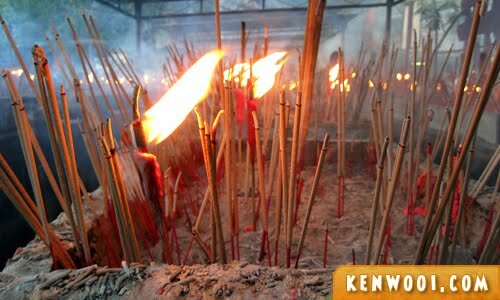 Being a Christian, I don’t observe Ching Ming – but All Souls’ Day instead, Nov 2nd, so I do not get to see all those things. You went back to Ipoh for Ching Ming, di you? similarly as STP, i dont really observe Ching Ming too, but will be joining Janice’s family’s one probably next round. Interesting, and the iron man one.. for real? wow your ancestors have a really luxurious life down there! WE HAVE IRONMAN IN HELL!! !O.O !! Hahah.. 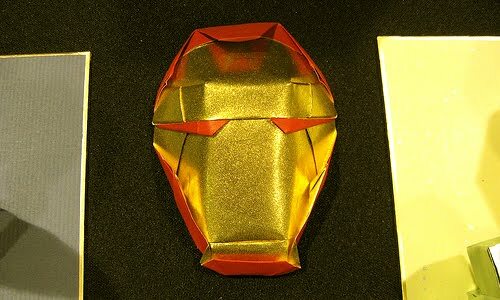 I like the iron man mask. 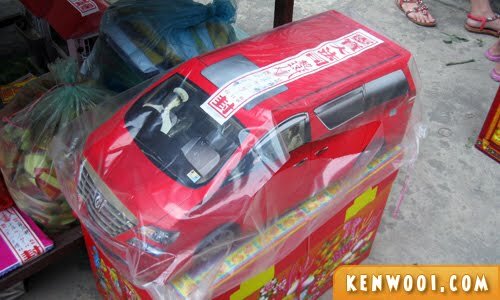 Hey, that’s not any ordinary red van, it’s toyota alphard. All branded stuffs…. Don’t burn Ipad or Iphone to our late great-grandparents or grandparents la, later they dunno how to use, come and haunt our dream every night…. nightmare, lo. I wonder if u burn the whole Iron Man suit to your ancestor, the heaven would be Avengers LOL! lol you had me all cracked up again! you’re a funny man! but seriously, the burning thngy is seriously very commercialised. You know, I noticed there are more awesome stuff each year. 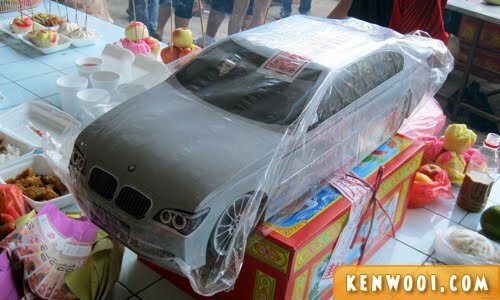 There was this family in Sibu which burned a *scale* model of a Mercedes. It had to be transported in one of those trucks that carries a fleet of cars in two stories.